Why would I need self storage in Mesa, AZ? There are a variety of reasons why you might need self-storage in Mesa, AZ. How much is a storage unit in Mesa, AZ? The cheapest storage unit in Mesa, AZ is $30.00 per month. What size storage units do you have available in Mesa, AZ? In Mesa, AZ we have sizes that range from 4'x4' to 10'x30' to suit your storage needs. How much is it for a 4'x4' storage unit in Mesa, AZ? The cheapest 4'x4' storage unit in Mesa, AZ is $35.00 per month. Mesa is one of the largest cities in Arizona and an integral part of the Greater Phoenix metropolitan area. The city has a continually growing population, thanks to its many amenities, beautiful setting and great weather. With a variety of shopping and dining options, quiet residential areas and a diverse economy, Mesa attracts families, young professionals and retirees alike. The Valley of the Sun has over 300 days of sun each year, so there's plenty of opportunity to get out and enjoy the city's many cultural and natural attractions. Mesa's origins date back thousands of years, to when the Hohokam tribe arrived and constructed a complex network of canals in the area, many of which are still used today. Settlers arrived in the late 1800s, and the town was incorporated as Mesa City in 1883. As the tourism industry grew and air conditioning became available, more people relocated to the desert town. Growth in the early 20th century brought health care facilities, a city hall, parks and recreation facilities, and a public library. Mesa experienced a boom shortly after World War II, thanks to nearby Williams Air Force Base and the related aeronautics industry. Mesa has many major employers in the health care, education, aeronautics and government sectors. Health care organizations like Banner Health Systems, CBI Medical & Behavioral Health and Mountain Vista Medical Center employ thousands of local professionals. The greater Mesa area is home to a number of industries, including trade and transportation, professional and business services, education and health services, and government. The city's fastest-growing industries are construction, information technology, education and health services, and leisure and hospitality. Mesa offers plenty of local attractions, including museums, water parks, archaeological sites and the spring training stadiums of several Major League Baseball teams. The nearby Superstition Mountains have several hiking trails where you can experience the natural beauty of the desert landscape. 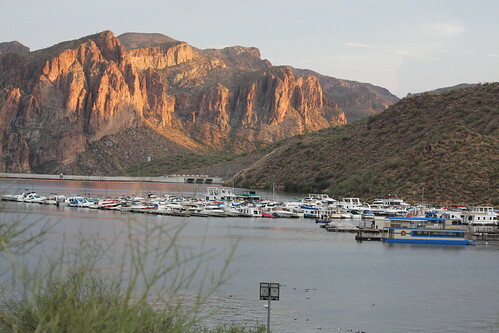 Mesa's Red Mountain District is nestled at the base of the Superstition Mountains, which provide the neighborhood's homes with majestic desert views. The nearby Salt River is the site of a favorite local activity called tubing, in which you take a leisurely trip down the river on an inflatable tube. Downtown Mesa is home to a vibrant Main Street, where you can browse antique shops overflowing with eccentric items and eat at a number of trendy restaurants. Many of the local homes are designated historic sites, some dating back to the early 1900s. Mesa's Fiesta District recently underwent major rejuvenation efforts, which brought many new businesses to the area. Here, you can enjoy a variety of shopping and dining experiences, and it's also home to many of the city's largest employers. Eastmark is one of the newest neighborhoods in Mesa, and it was designed to encourage a sense of community with its extensive bike and walking paths. A variety of special events take place at the local Great Park, which also includes a nature preserve, children's play areas and large green spaces. The Mesa Unified School District manages the majority of public schools in Mesa, including elementary, middle and high schools.You also have the option of many different charter and private schools in the area. The city of Mesa has several postsecondary institutions, including the Arizona State University's Polytechnic campus, which focuses largely on the fields of science and engineering. You can also pursue a two-year degree at Mesa Community College or attend any one of the several small private colleges in the area. Utilities: The city of Mesa facilitates all local utilities, including power, water and natural gas. Garbage and Recycling: The city of Mesa provides weekly curbside collection of both trash and recyclables and special programs for document shredding, bulk item collection and backyard composting. Transportation: Mesa offers both bus and light rail service, extending into the major metropolitan areas of Phoenix. You'll also be able to utilize a network of freeways to access the Greater Phoenix area. Mesa is home to hundreds of different neighborhoods, ranging from tiny to large. In general, the smallest neighborhoods are clustered along the city's western side, while larger, sprawling neighborhoods can be found on the eastern side. The cost of living in Mesa is fairly even with the national average, making this city an affordable option on any budget. Our lowest priced units in Mesa, AZ average $45.67 per month. 984 people have reserved units in Mesa, AZ in the past 30 days. There are 15 locations within Mesa, AZ's city limits. There are 12 locations in Mesa, AZ that offer AC and Heating features.